This short tutorial shows how to copy formatting in Excel using Format Painter, Fill Handle and Paste Special options. These techniques work in all versions of Excel 2016, 2013, 2010 and earlier. After you've put a lot of effort in calculating a worksheet, you would usually want to add some finishing touches to make it look nice and presentable. Whether you are creating a repot for your head office or building a summary worksheet for the board of directors, proper formatting is what makes important data stand out and convey the relevant information more effectively. Fortunately, Microsoft Excel has an amazingly simple way to copy formatting, which is often overlooked or underestimated. 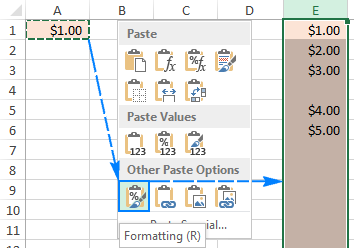 As you have probably guessed, I am talking about the Excel Format Painter that makes it really easy to take the formatting of one cell and apply it to another. Further on in this tutorial, you will find the most efficient ways to use Format Painter in Excel, and learn a couple of other techniques to copy formatting in your sheets. When it comes to copying formatting in Excel, Format Painter is one of the most helpful and underused features. It works by copying the formatting of one cell and applying it to other cells. 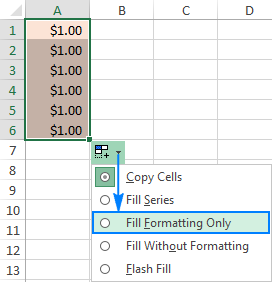 Select the cell with the formatting you want to copy. On the Home tab, in the Clipboard group, click the Format Painter button. The pointer will change to a paint brush. Move to the cell where you want to apply the formatting and click on it. Done! The new formatting is copied to your target cell. If you need to change formatting of more than one cell, clicking each cell individually would be tedious and time consuming. The following tips will speed things up. 1. How to copy formatting to a range of cells. To copy formatting to several adjacent cells, select the sample cell with the desired format, click the Format Painter button, and then drag the brush cursor across the cells that you want to format. 2. How to copy format to non-adjacent cells. 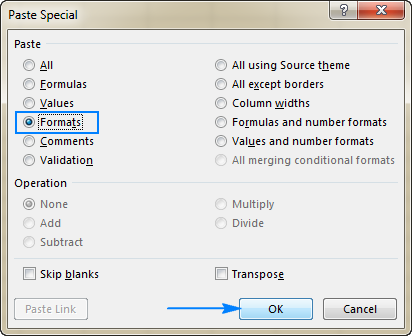 To copy formatting to non-contiguous cells, double-click the Format Painter button instead of single-clicking it. 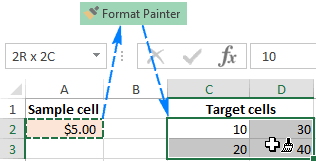 This will "lock" the Excel Format Painter on, and the copied formatting will be applied to all cells and ranges that you click/select until you press Esc or click on the Format Painter button one final time. To quickly copy the format of the entire column, select the heading of the column whose formatting you want to copy, click Format Painter, and then click the heading of the target column. In a similar manner, you can copy the format of the entire row, column-by-column. For this, click the sample row heading, click Format Painter, and then click the heading of the target row. As you have just seen, the Format Painter makes copying format as easy as it can possibly be. However, as is often the case with Microsoft Excel, there is more than one way to do the same thing. Below, you will find two more methods to copy formats in Excel. Format the first cell the way you want. Select the properly formatted cell and hover over the fill handle (a small square at the lower right-hand corner). As you do this, the cursor will change from the white selection cross to a black cross. This will also copy the value of the first cell to other cells, but don't worry about that, we will undo it on the next step. Tip. To copy the formatting down the column until the first empty cell, double-click the fill handle instead of dragging it, then click AutoFill Options, and select Fill Formatting Only. Excel Format Painter and Fill Handle work great with small selections. But how do you copy the format of a specific cell to an entire column or row so that the new format is applied to absolutely all cells in a column/row including blank cells? The solution is using the Formats option of Excel Paste Special. Select the cell with the desired format and press Ctrl+C to copy its content and formats. Select the entire column or row that you want to format by clicking on its heading. Right-click the selection, and then click Paste Special. In the Paste Special dialog box, click Formats, and then click OK.
Regrettably, Microsoft Excel doesn't provide a single shortcut that you could use to copy cell formats. However, this can be done by using a sequence of shortcuts. So, if you prefer working form the keyboard most of the time, you can copy format in Excel in one of the following ways. Select the cell containing the required format. Press Alt, H, F, P keys. Click the target cell where you want to apply the formatting. Alt activates the keyboard shortcuts for ribbon commands. H selects the Home tab on the ribbon. F, P select the Format Painter button. Select the cell from which you want to copy the format. Press Ctrl + C to copy the selected cell to the Clipboard. Select the cell(s) to which the format should be applied. In Excel 2016, 2013 or 2010, press Shift + F10, S, R, and then click Enter. If someone still uses Excel 2007, press Shift + F10, S, T, Enter. Shift + F10 displays the context menu. Shift + S selects the Paste Special command. Shift + R chooses to paste only formatting. These are the fastest ways to copy formatting in Excel. If you've accidentally copied a wrong format, no problem, our next article will teach you how to clear it :) I thank you for reading and hope to see you on our blog soon! 6 Responses to "Format Painter and other ways to copy formatting in Excel"
I enjoy a lot your post, maybe it is not the forum; I could not find in others posts or people questions. Nothing helped, do you have idea how I can do it? It is necessary to be kind of "automatic" format as the pivot functions to others select something and check the information in the clean way. Hi, I'm familiar with the Format Painter, but my corporate laptop was just upgraded to Office 2016 (from 2011 for Mac). In Excel, when using the Format Painter, it will sometimes not apply the same font or color as the original. Sometimes it will. Any idea what is up? I need your regarding Gregorian months name convert to Hijri months name with the help of excel formula. I would like to copy the value of one cell and its font and shaded color by simply using the =A2 formula. Cell A2 might be italicized and shaded yellow; if it is, then I need the other cell to reflect that formatting automatically. Select the cell you like the look of and then click Format Painter, and then click the cell you want to format. Just using =A2 won't copy the formatting. Hi, I use Excel 2013 and cannot find the feature in a special paste, which pastes a replica of the copied block. I do get nearly a replica but not the row height. However, the row height is material for me. The mirror copy option will not be useful for me. Could you kindly assist?